Hugs for Hailey: Make a Wish Update! We got a visit from our wish makers last night and it was a lot of fun! The night started off with a big bag from the Disney Store. Inside was one of Hailey's favorite people! Minnie Mouse! 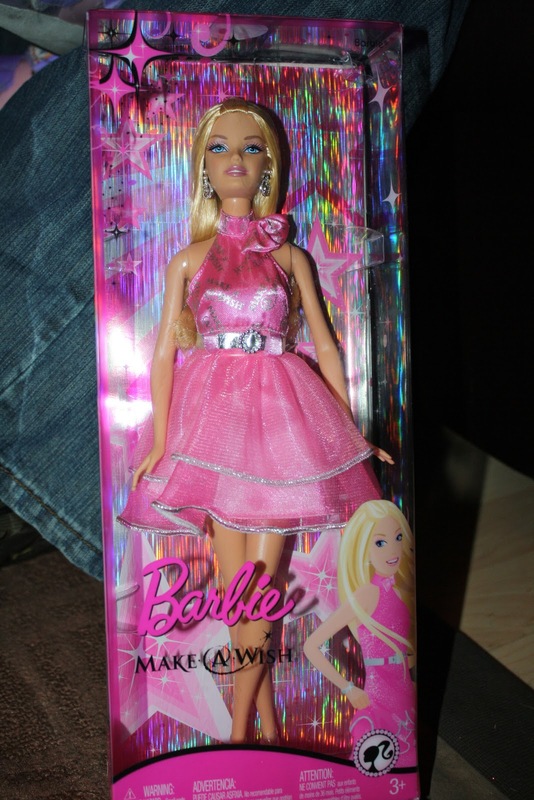 Hailey also received a Princess Cinderella Barbie and she also received this very special Make a Wish Barbie. These are exclusively for Wish kids and she did not get to stay in her box very long. Only long enough for two pictures. 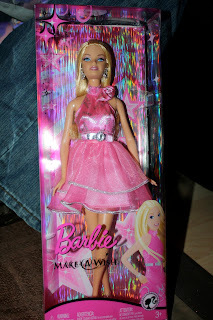 Hailey loved her pink dress. Hailey let us know that Pink was her favorite color. Our wish granters have made every necessary arrangement for us. They will have transportation to and from the airport, a rental car, some place for us to stay, tickets to the parks and even LUGGAGE! While I am sure Josh doesn't mind, I called the purple leopard suitcase and Hailey gets pink...of course! I can't wait to take pictures and fill up this awesome album they gave us as well! The top of it says Hailey's Wish April 2013 and the bottom is engraved with Give Kids the World! Hailey loves looking at photo albums. I have tons of the Snapfish books I've made for her. I am guessing this will be her new favorite! Thank you to our wish granters Nancy and June! They have helped us with everything we need and told us to prepare to have the most memorable family vacation ever! Even though this Make a Wish comes at such a high cost with Hailey's health we are so glad that this program exists to help families have such special moments during the time they are caring for a child with a life threatening illness. If you are ever looking to donate to a worthy cause please keep Make A Wish in mind! April can't get here fast enough! !